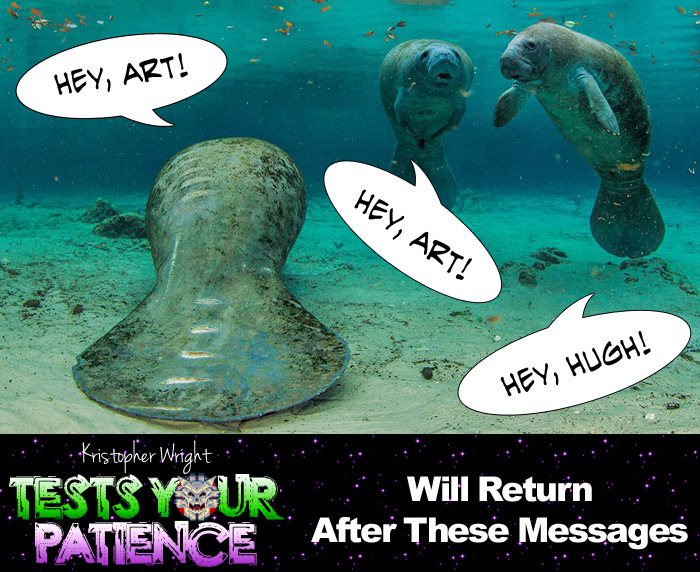 This might have been funnier if I hadn't picked an image of a manatee that has clearly been injured by somebody's boat propellor. Whoops. The most profound statement on art of our times. You know, thinking about it, maybe the fact that he has been damaged by a motorboat really drives the point home. Ok. From now on, I'm saying it was intentional. You plebs just don't get it. I freakin love this comic. And why do I always read the title as TEST YOUR PATIENCE!! with the MK voice? This is really incredible work. Even I'm not sure if I'm being serious or not. It's been 50 (long) Weeks since we've had a new Webcomic posted..
And this is still funny. Somehow. Anyone else getting something up soon? Oh wow, I looked at the date of the original post and for a second there I thought it was March 20 already. Damn, I should've waited 'til March 20th, and then been like, "It IS March 20th!" Ah, well. I would've forgotten, anyway.